Why Come to Aesthetic Laser Care for Your Next Fraxel Laser Treatment? • Our Fraxel nurse, Marianne Carruth RN, has performed hundreds of Fraxel laser treatments since 2008. Dr. Michael Lafkas is always available for consultation and has personally customized all Fraxel settings and protocols to the condition being treated. • Aesthetic Laser Care has performed thousands of Fraxel Laser treatments since 2005, and we have many satisfied customers. Full Strength Face Fraxel: $650 (Add Neck, hands or chest for just $350). 1/2 Strength Fraxel Full Face Treatment: $400. Fraxel 1/2 Strength is a less aggressive Fraxel Laser Treatment and has less downtime and discomfort because of the lower total energy used during treatments. Fraxel Lite is best suited for individuals wanting to even out skin tone and fine lines without the significant downtime, swelling and redness of full strength Fraxel Laser (call us for more info). Ultra Light Fraxel Full Face Treatment: $250. Our lowest strength Fraxel Laser Treatment requires only 5 to 10 minutes of topical numbing time and takes 30 minutes to perform. It has very little downtime and discomfort because of the much lower total energy used. In general, a series of 3 treatments are used at 2 week intervals to maximize the dermal rejuvenation. Turbo Charge your Fraxel by adding an IPL full face to this treatment for $75. (call us for more info). Just as a photographic image is altered pixel by pixel, Fraxel Laser Treatment improves your appearance by affecting only a fraction of your skin at a time with thousands of tiny microscopic laser spots. Fraxel treatment promotes your skin’s own healing process, resulting in natural rejuvenation that removes years from your appearance. Fraxel laser produces thousands of tiny columns of treatment in your skin. Unlike other laser treatments, Fraxel treatment is able to precisely treat thousands of microscopic areas of skin called microthermal zones (MTZs), using pinpoint laser beams that penetrate beneath the skin’s surface to eliminate damaged skin cells. Fraxel treatment stimulates the body’s own natural healing process which replaces damaged skin with fresh, glowing, healthy skin. By design, Fraxel treatments will target between 15 and 25 percent of the skin’s surface, leaving the remaining untreated skin available to quickly heal the treated areas. This "fractional" treatment allows the skin to heal much faster than if the entire area were treated at once. Fraxel is safe and effective on delicate skin areas like the neck, chest and hands, in addition to the face. You can expect two levels of results, immediate and progressive. Immediately after initial healing is complete, the surface of your skin will feel softer, look brighter, and the skin tone will start to become more even. Progressive results occur over the next three to six months as the deeper layers of skin continue to heal. During your consultation, we will determine the best treatment plan for your desired results. In general, an effective treatment regimen is 3 to 6 sessions, spaced about 2 to 6 weeks apart. Depending upon your condition and schedule, you may choose to space treatment sessions even further apart. Optimal improvement is usually visible 2 to 3 months after your last treatment. Avoid significant sun exposure for 2 to 3 weeks prior to your Fraxel treatment. Also avoid topical retinoids one week prior to your treatment. 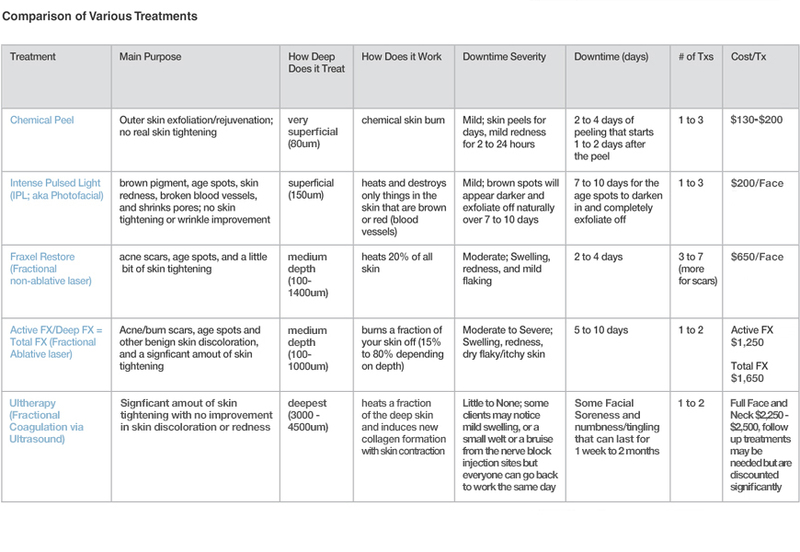 Accutane should not be used within 6 months of Fraxel treatment. Please arrive to the office without any makeup. Ideally, it is best to wash your face just prior to your treatment. Fraxel treatment requires topical anesthesia and a special cooling fan. Topical anesthesia needs to be applied 45 minutes prior to treatment, and treatments take 30 to 45 minutes. Please plan on being at Aesthetic Laser Care for a total of 2 hours on your Fraxel treatment date. Treatments are well tolerated and most people report mild to moderate burning during the treatment. You will experience a moderate sunburn sensation for several hours after your treatment. You may apply make up or shave the day after your treatment. Some patients are able to return to routine activities, including work and social obligations, the same day of treatment. Others require a little more time, depending on their skin condition, age, and treatment level. The skin may have a pinkish tone for 2 to 7 days. This is a normal sign that the skin is healing. Mild to moderate swelling is normal and generally resolves in 2 to 4 days. New epidermal skin starts to develop within 24 hours. • Bronzing: Your skin will have a bronze appearance that lasts anywhere from 3 to 14 days, depending on your treatment level. • Flaking: Your skin will naturally exfoliate as new skin replaces dead tissue. Flaking is similar to that of a minor sunburn, but without the associated pain. Use of a moisturizer will mask the appearance of flaking. Sunscreen: Be sure to use sunscreen during both the healing phase and for several months after treatment. Apply a sun block with an SPF of at least 30. For added protection, use wide-brimmed hats when in direct sunlight. Individuals with darker skin (Skin Type 4 or greater) are at higher risk (10% to 20% risk) of hyperpigmentation (skin darkening) from Fraxel treatment and we highly advise them to pretreat with a prescription bleaching cream (e.g. Obagi) before and after their treatments to minimize this risk. Also, sun avoidance 4 weeks before and 6 weeks after Fraxel treatment is very important to minimize the risk of hyperpigmentation. Over several months, the body repairs the deeper treated dermal tissues, producing longer beneficial changes and a youthful appearance. * If you are prone to herpes cold sores around the mouth and are getting Fraxel treatments around the mouth, you may need to begin treatment with Acyclovir antiviral medication the day of your treatment to prevent an outbreak. In general, there is no need for Acyclovir if you are not being treated around the lips.